A model Mini Cooper car toy, in the style of the original Mini Cooper made at Cowley, Oxford. Back in its early years, the traditional Mini had been made at both Cowley and Longbridge. BMW’s “Plant Oxford” in Cowley is on the site of what was historically the Pressed Steel Company body plant – next door to what was the Morris factory. Todays Minis are assembled at Plant Oxford in Cowley. 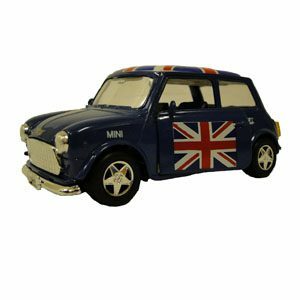 This model Mini Cooper car toy, in the style of the original Mini Cooper, has draw-back action and is available in red or blue, with the union flag on its doors and roof.